The sweet potatoes are in! 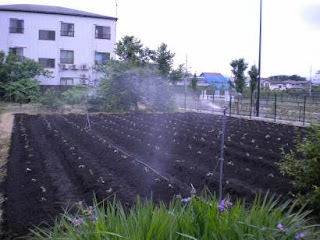 We arrived on an unusually cloudy and cool morning for late May to find Takashi-san setting out the slips on the rows. 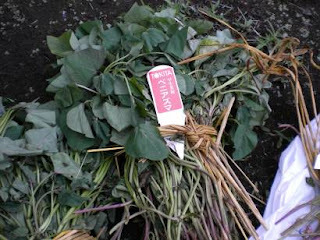 Spaced about two feet or 60 centimeters apart, these little slips (bundle pictured above) will grow into some impressively massive tubers by fall (see photo for below for a sample of last years harvest) that will be made into everything from tempura to frilly desserts to mochi. (As well as my favorite sweet potato stew recipe!) Autum is also when carts selling roasted sweet potatoes appear. Hot coals carefully tended in the back roast the potatoes, which are simply sold whole as a warm tasty snack for those slightly chilly days marking the turn of the season. The slips at first glance appear only to be stems with leaves at one end. A closer examination shows small nodules along its length where roots will form. 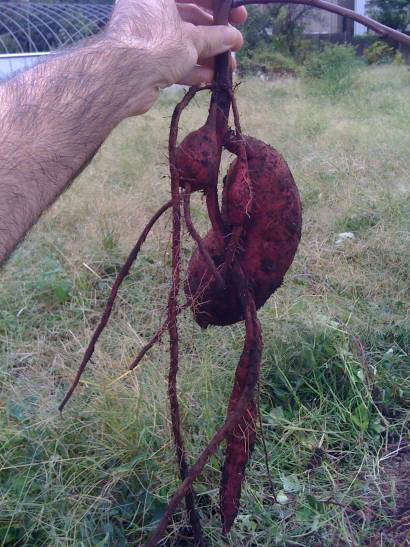 These will turn into sweet potatoes, of course, but as the plant grows and stretches into the field more of these nodules will also anchor the plant to the soil. The plants require little to grow except a somewhat sandy medium, plenty of sunlight, and regular watering as they mature. No additional compost is needed to get a good hearty crop, which makes it easy to understand the historic popularity of growing this tuber. Very cool! I've grown regular potatoes these past few years but never sweet potatoes. Part of me wonders if I should try, as I'm very fond of sweet potatoes, and part thinks that I'm probably overextended enough in the garden as it is. But I do wonder how they'd do in New England. Me, too, Pandabonium! Well, almost everything has turned into my favorite food since moving here, but that's another story. Try the soup chilled. I bet it would be perfect for a hot summer day! Sue, I think you can do it. I did an interview series at Project Grow (see blog sidebar) and this particular grower makes them appear in Michigan. I bet it's possible. And this would be a pretty easy root crop - plant and water - then dig in the fall. They might require some mulching, but that might be it. Oh, I'm excited for you! Hope they help to understand the process a bit, Anjuli. It's such a fun thing. I remember those "yaki imo" vendors from my years in Tokyo. Thanks for taking me back. They're one of the hallmarks of the season, aren't they? Thanks for reading, Susan! If only sweetpotatoes grew as easily here - they fix their own nitrogen too. I'll still keep trying. Thanks, Rhizowen! I had no idea they were nitrogen fixing. Delicious and fascinating to boot. I'm going to mention this over at your blog, too, but you might be interested in (and already know about) an organization called PROINPA (http://www.proinpa.org/)that offers an amazing selection of sweet potatoes. It is all in Spanish, but it might still prove quite useful to you.